I’ll come clean: a ticket to see First Aid Kit would not have been my first choice. I loved ‘Blue’, and thought their harmonising beautiful, but as someone who tends to like music with a bit more bite, I wasn’t falling over myself to catch them live. Due to family sickness, however, a pair of tickets for their performance at the Royal Albert Hall during the last week of September fell into my ungrateful hands. The friend who I gave the second ticket to was elated, whereas I felt somewhat lukewarm. The evening would prove to be delightful surprise. It was my first trip to the Royal Albert Hall. What a venue! I wholeheartedly encourage all readers to try and make the journey there at least once in their life. It was impossible not to be awed by the incredible surroundings, so we were off to a good start. The audience was a happy mix of young and old, indicating the band’s appeal across the age spectrum. Swedish sisters, Johanna and Klara, who make up First Aid Kit, strode onto the stage, both resplendent in gold attire, and supported by a string section, drummer and lap-steel guitarist. From their first track ‘Stay Golden’ from their third album, released earlier this year, they were impossible to resist and I – along with the rest of the audience – were entranced by their flawless, pitch-perfect harmonies. For one song, they switched off their mics, their powerful and soaring voices filling the immense space with ease. The pair spoke of their delight at performing at such a renowned venue and of the presence of their Swedish family, that evening, not least their father, who as their sound engineer, is responsible for ensuring their sublime voices sound perfect. The pair performed two covers: ‘Love Interruption’ by Jack White and ‘America’ by Simon and Garfunkel. My companion felt the latter choice to be a little ambitious, but I couldn’t have disagreed more: a beautiful song, beautifully sung, it reduced me to tears. 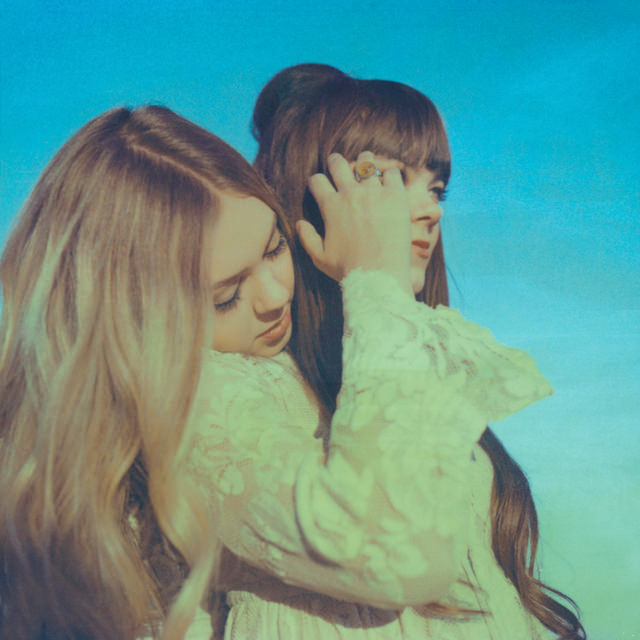 I’m in good company: First Aid Kit covered Patti Smith’s ‘Dancing Barefoot’ at the Polar Music Prize in 2011, the year Patti Smith won the prestigious prize. Footage from the event shows Patti with tears rolling down her face at the end. A year later, when Paul Simon won the prize, the pair sang ‘America’. At the end of the track, he stood to clap the women, mouthing the word “great”. You can check out the footage here, learn more about the band here and read a fantastic article here in which the pair discuss feminism and the role of women in music. Don’t forget the tissues. The image shows an upper body shot of Johanna and Klara of First Aid Kit. Johanna is stood behind Klara, her head resting on Klara’s shoulder, eyes downcast and long, blonde hair streaming down. Klara’s face arm is reaching up to her temple, obscuring part of her face. She gazes ahead. Image by Neil Krug, shared under a Creative Commons license.